On 9 September 2015, Elizabeth II, Head of State of the UK and other Commonwealth Realms, surpassed the reign of her great-great-grandmother, Queen Victoria. Learn about this most respected of Rulers - Her Royal Highness has reigned for over 63 years with a life of devotion and dignity. The year 2012 saw the Diamond Jubilee celebrations for her reign – only the second British monarch to reach this milestone. This app is a tribute to Her Majesty and her life devoted to public service. It contains all sorts of interesting information about her reign. All of the information is stored locally, but there are wiki hyperlinks throughout allowing access to more detailed information. > Learn about the spectacular events that took place in the 2012 celebrations. > Read about the life of Queen Elizabeth. 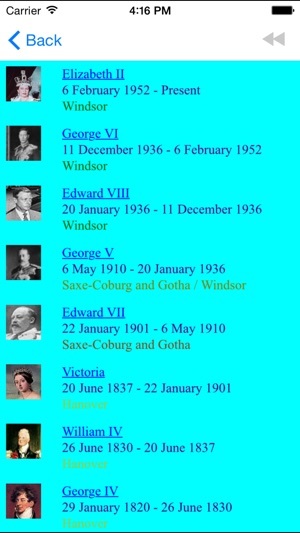 > Find out about other monarchs who have celebrated Jubilees. > Discover what life was like in Britain 60 years ago. 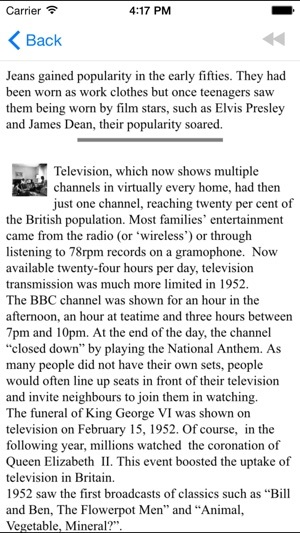 > Read about the music charts and food prices when Queen Elizabeth came to the throne. 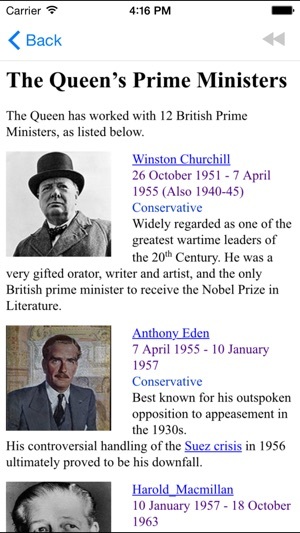 > See which Prime Ministers have served under The Queen during the 60 years. > Study a list of all of the Kings and Queens who went before her. > Read the list of the next 100 people in the line of succession. 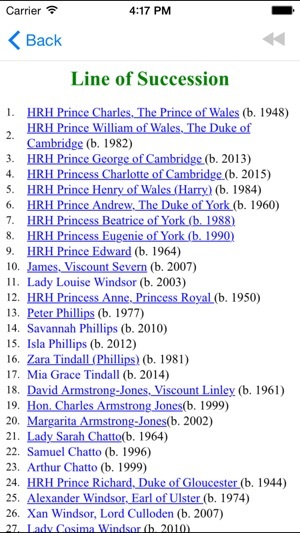 Updated to include Prince Louis Arthur Charles in the line of succession. Also includes the Queen's 92nd birthday party at the Royal Albert Hall. This is a fun app for certified anglophiles. Everything you wanted to know about the reign of England’s longest reigning monarch.